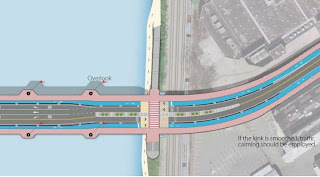 The South Street Bridge Coalition is asking that people concerned about the current design write letters to make the reconstructed South Street Bridge safer and more equitable for bicyclists and pedestrians, including persons with disabilities. You can send an email or hardcopy letter by going to this webpage (Be sure to add in your own personal message)! It appears from the pdf that the community design places bike lanes to the RIGHT of a right-turn only lane. This is exceedingly poor design, and guarantees conflict between the large number of motorists entering I-76 and cyclists traveling straight. Even the diagonal blue painted bike lane on the Walnut Street bridge is better than this, although the only really good approach is to have a perfectly straight bike lane with the right-turn lane beginning to its right, so that it is completely clear that cars must yield to cyclists before crossing the lane. The diagonal lanes leave the right of way unclear to everyone. That said, it's still better than keeping a bike lane to the right of turning traffic right up to the intersection. Is the Bicycle Coalition really supporting this design? I second these concerns but if you looked closely you will have noticed that the "current design" from the DOT has the same potential right-hook hazards. This could potentially be solved with a Walnut St merge design but would require removing more of the shelter wall the proposed "community design" has leading up to the intersections. I think it could be done though but I'm no engineer. Yes we are supporting the design. 1 - right turn only (peds and bikes stop). 2 - left turn only. 3 - straight through, peds and bikes go. We are advocating for a social marketing campaign at the re-opening of the bridge and a red light and red light cameras, we will not support the design otherwise.